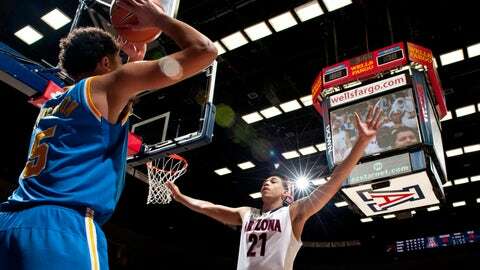 Kyle Anderson and UCLA went 3-0 against Brandon Ashley and Arizona last season. 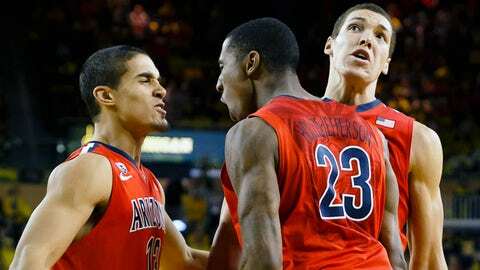 TUCSON, Ariz. — The storylines are always plentiful when it comes to Arizona vs. UCLA basketball. Famed program (UCLA) vs. its pre-eminent challenger for West Coast dominance (Arizona). Rosters filled with marquee recruits. Prestige, pride and publicity on the line. And, as is often the case, both teams trying to get a leg up on the rest of the competition in the Pac-12 Conference. It is The Rivalry on the West Coast. And the latest chapter unfolds Thursday night at Pauley Pavilion, a matchup of UCLA’s revved up offense under new coach Steve Alford and top-ranked Arizona’s shut-down defense. "I think for our conference and West Coast basketball, it’s always great when UCLA and Arizona both have good teams because of the history of both programs," Arizona coach Sean Miller said. The names have change but never the challenge. This time it’ll be Aaron Gordon vs. Kyle Anderson and Brandon Ashley vs. Travis Wear. And, of course, all the rest. "It’s an excellent team filled with individual talent," Miller said. "They are playing well, especially offensively." Even with victories over Duke and San Diego State, UCLA (12-2) should be top-ranked Arizona’s toughest task to date. The recent numbers show just how tough. After going 13-7 vs. the Bruins in Lute Olson’s first 10 years, Arizona went 10-10 over the next 10 years and then 5-6 in Olson’s final years. Miller has fared no better, going 5-6 in his four years, including losses in the last three straight. "Historically it has been a difficult challenge," Miller said. Of course, the Bruins know that, too. "We have been thinking about it since we beat them three times last year," Anderson was quoted in the Los Angeles Times. "We’re just going through the same things to prepare for them as we did for USC." And what UCLA did to USC on Sunday was not pretty unless you’re a fan of Bruin blue. UCLA ran past, around and through the Trojans, 107-73. The Bruins are faster and more cohesive than in previous years. Better? Time will tell, but they are scoring at a nice clip. "Our offensive production has been outstanding, and we’re probably playing the best defensive team we have played all year," Alford said of Arizona. "They hang their hat at the defensive end. Something has got to give. We have four days to come up with a good game plan." Miller said the versatility of UCLA’s players is especially challenging. "It seems that each one of their players is a good fit," he said. It starts with Anderson, who is 12 for 24 from beyond the 3-point line. He’s averaging 15.1 points and nine rebounds and has 92 assists. "The way he impacts the game is so unique," Miller said. "He’s 6-foot-8, 6-foot-9 — he’s a very difficult matchup." Then there’s Jordan Adams, who leads the team with an 18.7 scoring average, Norman Powell and the 7-foot Wear twins (David and Travis). "Every team would love to have two fifth-year seniors with their size and skill level," Miller said of the Wears. "They impact the game in so many ways. They have a good team." After years of a slow, methodical pace under Ben Howland, the Bruins began to up the tempo last year, and that transition has picked up under Alford. The Bruins are averaging an eye-opening 87.1 points per game. In contrast, Arizona, a team that likes a fast pace, is averaging just under 75 points per game. The equalizer for the Wildcats has been a defense that is holding opponents to 36 percent shooting from the floor and 28 percent from beyond the 3-point line. Arizona will have to continue the trend. "What you want to do on the road — all coaches feel this way — you want to do the things you do well, whether youâre at home or on the road," Miller said. "You donâ’t want to be a different team when you’re not playing at home. You look at your stats sheet at home, and (think), ‘Wow, you really do a great job on defense,’ but as soon as you go on the road, you donât play any defense. "You want have your identity in both. When we’ve gone on the road we’ve had that. That doesn’t mean it’s going to continue. But that’s the key to us playing well on the road."